Scores of cops in seven precincts in the Bronx and Upper Manhattan repeatedly drive their personal vehicles recklessly in and around the neighborhoods they are have sworn to keep safe, Streetsblog’s ongoing investigation has found. In the latest chapter of our “s-cop-laws” probe of police officers’ and employees’ off-duty driving, Streetsblog looked at all non-duty vehicles parked in NYPD-only spaces or parked illegally with placards at the 40th, 43rd, 44th, 45th, 46th and 50th precincts in the Bronx, plus the 26th stationhouse in West Harlem. We then ran the plate through the Howsmydrivingny database, which records parking tickets and camera violations such as running a red light or excessive speeding. 272 cars — or 72.5 percent — had been ticketed for something. 192 cars — or 51 percent — had received a camera-issued ticket for speeding or running a red light, the most serious moving violations. 117 cop cars — 31 percent — had multiple serious moving violations. 966 cars — or 76 percent — had been ticketed. 733 cars — or 58 percent — had received a camera-issued ticket for speeding or running a red light, the most serious moving violations. 475 cop cars — 37.5 percent — had multiple serious moving violations. How bad are these police officers compared to the general public? Very bad. Earlier in this series, we ran the plates on 100 random cars in two New York neighborhoods as a control group. We found that only 36 percent of the normal people’s cars had been ticketed for at least one serious moving violation — compared to the 58 percent of police officers’ personal cars. And roughly 19 percent of normal people have received a second ticket for a serious moving violation — also about half of the NYPD rate. The NYPD has declined to comment for this series, issuing only a statement that it expects its officers to obey all driving laws — which they do not, as this story and this story clearly show. Why are we doing this investigation? Our series on recklessly driving cops and NYPD employees began last month, after Mayor de Blasio said he intended to reduce police parking abuses by building or leasing more legal parking spaces for NYPD officers, who currently park wherever they want, mostly illegally thanks to department-issued placards. Streetsblog has long reported on needless additional driving — especially by city workers, who, studies show, are far more likely to drive if they are promised a parking space at work. At the 120th Precinct on Staten Island, 87 percent of the cars had at least one serious moving violation and 74 percent had multiple serious violations. At the 78th Precinct in Park Slope, we found one car with 53 speeding tickets and five red-light tickets since March 2017. In all, 41.5 percent of cars at that station house had multiple tickets for serious moving violations. At the 23rd Precinct in East Harlem, one driver had run up 63 total tickets, including 34 speeding tickets and seven red light tickets. At the 70th Precinct in Brooklyn, 56 percent of the cars had multiple serious violations. At every one of the two-dozen precincts in our investigation there were many officers who had at least seven speeding tickets. 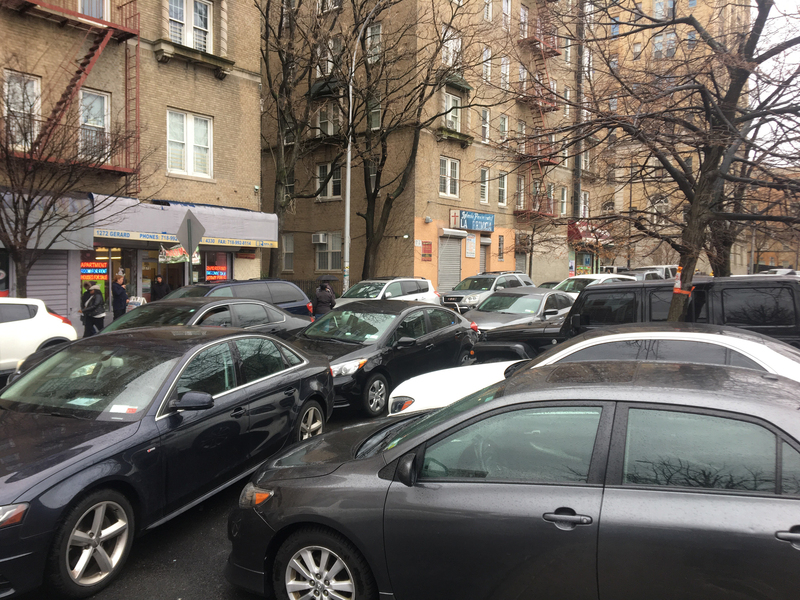 Many of those would have their cars impounded under the provisions of a pending City Council bill by Brad Lander that would allow authorities to tow away any car with more than five serious moving violations in any 12-month period. At the 50th Precinct, which covers the northwest Bronx, 52 percent of the police officers’ cars had serious moving violations and 38 percent had multiple serious moving violations (these figures do not count several cars with illegally covered or defaced plates). The worst offenders at that command included a car with three speeding tickets since Feb. 2, 2019 (plus a red light ticket) and a car with 12 speeding tickets, plus one red-light ticket. At the 44th Precinct, which covers Highbridge and Concourse Village, 53 percent of the cops had serious moving violations. But the worst offenders included one cop with 10 serious moving violations, one cop with three such violations (but two missing plate violations, so…); one with four speeding tickets since December, 2018; two with five serious moving violations; and five with three. These figures do not count several more cars with illegally covered or defaced plates. At the 26th Precinct in West Harlem, 61 percent of the vehicles had moving violations and 53.6 percent had multiple serious moving violations (these figures do not count several cars with illegally covered or defaced plates). The worst offenders there included a cop with so many moving violations — seven since mid-2017! — that he would be taken off the road under the Lander bill, plus two cops with six moving violations and two with five. The worst driver at the 26th Precinct. At the 43rd Precinct, which covers Soundview, 74 percent of the cops had gotten a ticket for a serious moving violation and 31 percent had gotten multiples (these figures do not count several cars with illegally covered or defaced plates). The worst offenders there included two cops who had seven moving violations — both of whom could have their cars impounded under the Lander bill. One of the cops got all seven speeding tickets since September, 2017. The worst driver at the 43rd Precinct. At the 45th Precinct, which covers Throgs Neck and Co-Op City, 52 percent of cars had serious violations and 33 percent had repeat serious violations (these figures do not count several cars with illegally covered or defaced plates). The worst offenders there included eight cops with three serious moving violations, two with four, three with five, two with eight (who would be off the road under the Lander bill) and one with nine (also a candidate for the boot). The worst driver at the 45th Precinct. At the 46th Precinct, which covers University Heights, 43 percent of the cops have received serious moving violations, lower than the citywide average (these figures do not count several cars with illegally covered or defaced plates). But the worst offenders include many reckless drivers, including one cop with 20 total tickets, including four red-light offenses; one with five serious moving violations, though likely more because he’s also been charged twice with missing plates; one with 29 total violations, including 15 serious moving violations; one with nine; one with eight; and two more with five serious violations. The worst driver at the 46th Precinct. The 40th Precinct, which covers the South Bronx, had officers who were almost as safe as everyday drivers, with 42 percent receiving a serious moving violation and 22 percent receiving multiples (these figures do not count several cars with illegally covered or defaced plates). 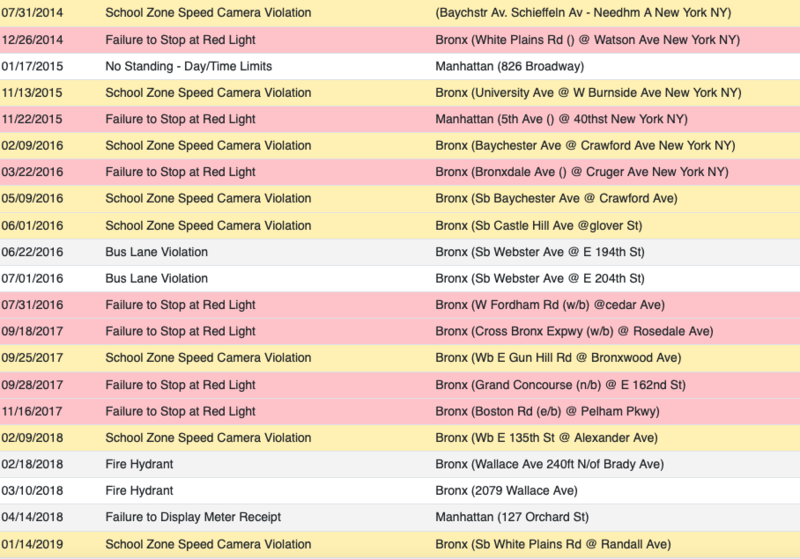 The precinct’s worst offender was one cop with 89 total violations, including 19 red light tickets and 19 speeding tickets (pictured below). But the stationhouse also has a cop with 12 serious moving violations, one with six, one with five and one with four. 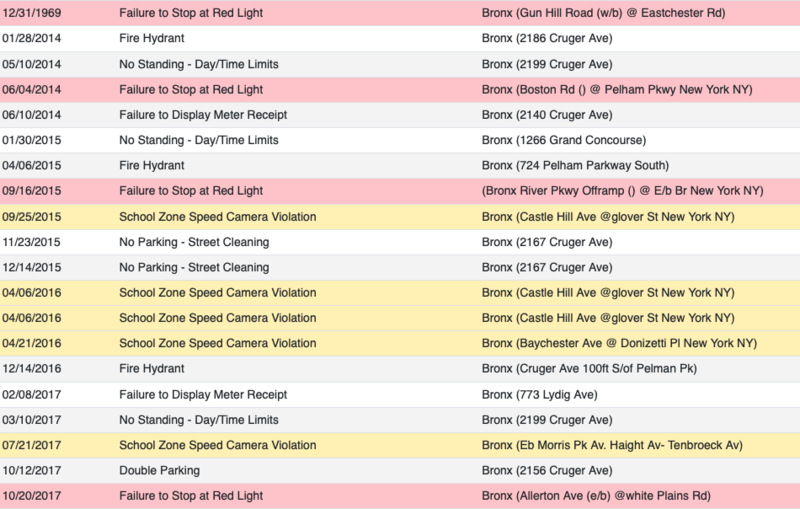 This is the bad driving record of one employee at the 40th Precinct in the Bronx. Taken together, it’s an appalling and dangerous safety record. Mayor de Blasio has repeatedly ignored the danger, and, in fact, questioned why Streetsblog is pursuing it — even though it was his plan to encourage more driving that initiated our coverage. Last month, we had this exchange with the mayor after asking whether he was concerned about more driving by clearly reckless cops. I disagree with that on its face. … The fact is these are our first responders, we expect them to show up no matter what. We expect them to stay when we need them to stay. A lot of them live quite far from where they work. It is important for everyone to drive safely. That’s what Vision Zero is all about and Vision Zero is filled with consequences and you are seeing more and more consequences each year. But it makes no sense to say, “OK, we know a lot or our uniform service officers have to drive to work and we are not going to give them a park.” That makes no sense. We are clearly very adamant that everyone has to follow the rules and there are consequences for those who don’t. But if we want to stop placard abuse we need to do something the root causes. In a follow-up question, we asked the mayor about his use of the words “have to” in relation to commuting by car. Certainly, 51 percent of the police force lives outside the five boroughs, but the base salary of a New York City police officer is $85,292 after five years on the force, an income that is roughly $35,000 above the citywide median income. There is no way police officer “have to” drive to work because there is no way a police officer has to live outside the city on that salary. This is the latest entry in Streetsblog’s ongoing series on scofflaw cops or “s-cop-laws.” All of the prior stories are archived here. One way to get the mayor to care about this public health menace is to trick him into thinking it’s delivery cyclists who are breaking all these laws.